As in legacy LTE, for LTE-M1, MIB/SIB1/SIB2 carries the most fundamental information for cell detaction and initial attach process. In this page, I will describe all the SIBs related to LTE-M1 operation, but it would take long time for me to complete this page... this is at the initial stage now. How the SIB1-BR transmission timing is determined ? How the Narrowband index for SIB1-BR is determined ? How Transport Block Size (TBS) for SIB1-BR is determined ? How to Configure the StartSymbol for SIB1-BR ? 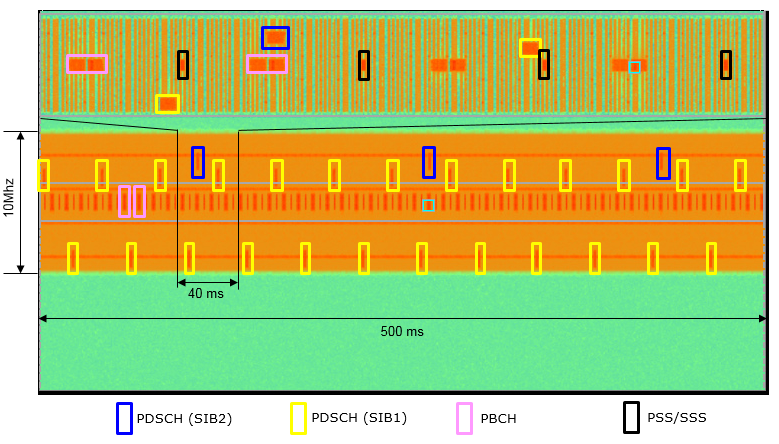 How the SIB2 transmission timing is determined ? How the Narrowband index for SIB2 is determined ? How Transport Block Size (TBS) for SIB2 is determined ? How to Configure the StartSymbol for SIB2 ? schedulingInfoSIB1-BR-r13 : This indicate whether SystemInformationBlockType1-BR is scheduled or not and if it is scheduled, what is the repetition pattern of the SystemInformationBlockType1-BR. If this IE is set to be 0, it means SystemInformationBlockType1-BR is not scheduled. If this IE is a none zero value, it means SystemInformationBlockType1-BR is scheduled and the repetition pattern is defined in the following table. phich-Config : This IE will be ignored in LTE M1(BL/CE) UE (Refer to 36.331 MasterInformationBlock section for confirm). The overall function and the information carried by SIB1-BR is similar to SIB1 of legacy LTE. The contents of SIB1-BR can be categorized as below. Scheduling information for SIB2 and other SIBs. One of the major difference between SIB1-BR and legacy LTE SIB1 is about resource allocation (time domaining scheduling and frequency domain location). In case of legacy LTE, the scheduling for SIB1 is determined by relatively simple logic as described in LTE : SIB scheduling. However, in LTE BL/CE, SIB1-BR scheduling is much complicated as described in this section. The time domain scheduling for SIB1-BR is determined by only a single IE (information element) in MIB. However, real scheduling is pretty complex. Then how the only one parameter can determined such a complicated scheduling. One of the most common trick for this kind of case is to use various kinds of predefined tables and the IE in RRC message just point to a specific record in the table. 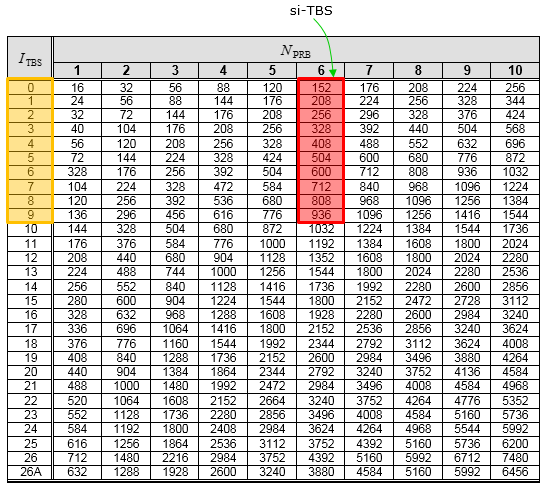 In case of SIB1-BR case, the time domain scheduling is defined by two tables : 36.211-Table 6.4.1-1 and Table 6.4.1-2. How can we figure out which of the two tables to use ? It is the system bandwidth. If the system bandwidth is same or lower than 3 Mhz, 36.211-Table 6.4.1-1 will be applied and if the system bandwidth is greater than 3 Mhz, 36.211-Table 6.4.1-2 will be applied. Now let's look inside the table Table 6.4.1-2. You see three records highlighted in different colors. Now the question is how we can figure out which records to use ? (In case of Table 6.4.1-1, there is only one record. so you don't have to worry about this). It is determined by another table : 36.213-Table 7.1.6-1. 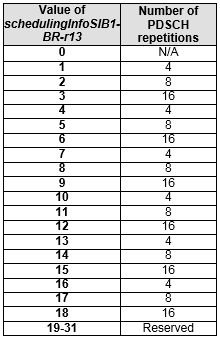 You can associate the two tables (36.213-Table 7.1.6-1 and 36.211-Table 6.4.1-2) by color coding. Then the last question is how can we figure out which color (4 or 8 or 16) in 36.213-Table 7.1.6-1 ? It is defined by SystemInformationBlockType1-BR in MIB. Now let's look into how the frequency domain location for SIB1-RB. Unfortunately we have to do a little bit of math to figure this out whether you like it or not :). 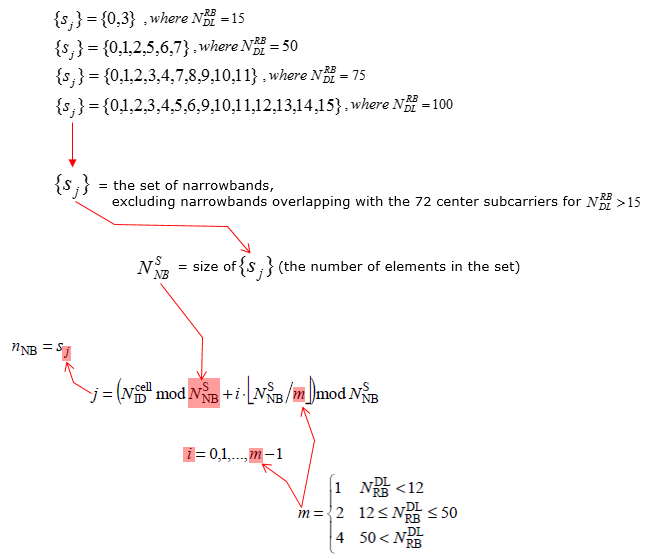 The frequency domain location (Narrowband Index) is determined by following equation. You don't have to care too much about the equation unless you are not a baseband engineer who has to implement this algorithm. The only thing you need to know is that the frequency domain location (Narrowband Index) changes at every transmission. Following is from 36.211 - 6.4.1 Physical downlink shared channel for BL/CE UEs. Following is my Matlab code implementing the above equation. Please let me know if you find any problem with this code. 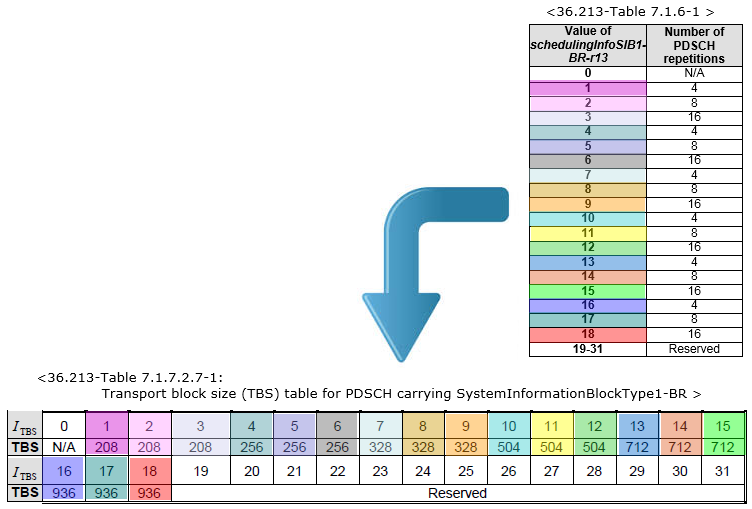 The Transport Block Size for SIB1-BR is also determined by a predefined table 36.213-Table 7.1.7.2.7-1 as shown below. The index in the table is determined by schedulingInfoSIB1-BR-r13 IE in MIB. How can UE figure out the start position (start OFDM Symbol) of PDSCH carrying SIB1-BR ? Since LTE-M1 does not support (PCFICH), there should be another mechanism for UE to figure out how many OFDM symbols should be reserved for the control signal for legacy LTE. Theoretically LTE-M1 would not need to reserver the first 1 or 2 or 3 or 4 symbols for control signal since LTE-M1 does not use PCFICH, PHIBH, PDCCH. However, it should consider on any possible collision with legacy LTE operation. So it should leave out the first 1 or 2 or 3 or 4 symbols when it is allocating PDSCH. Then you would the question at the beginning : How can UE figure out the start position (start OFDM Symbol) of PDSCH carrying SIB1-BR ?. The answer is 'it is determined by a predefined rule as below'. 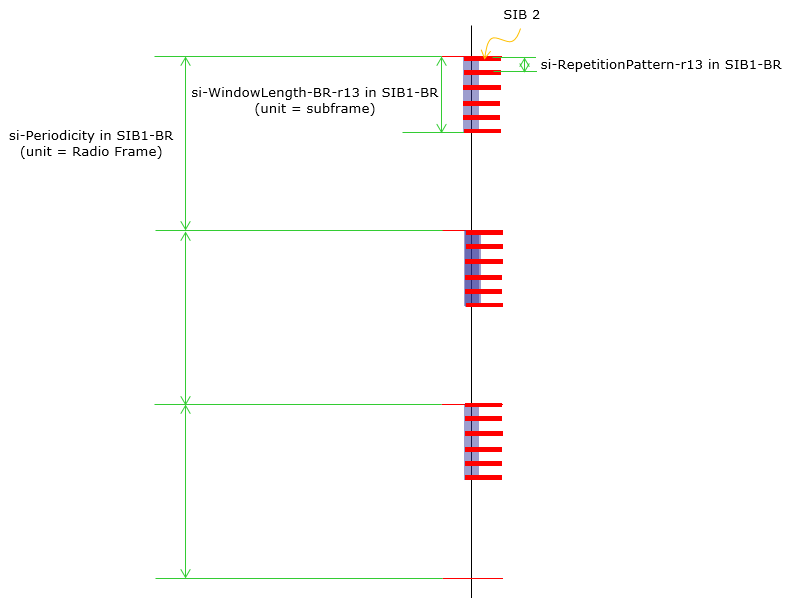 si-RepetitionPattern : This indicate in which radio frame within SI Window a SI message can be transmitted. For example, if it is configured as 'everyRF', it means in any radio frame in SI Window a SI message can be transmitted. if it is configured as every2ndRF, it means that SI message can be transmitted in every second radio frame from the beginning of SI Window. fdd-DownlinkOrTddSubframeBitmapBR : This indicate which subframe can be used for downlink. '1' in the bitmap indicate the corresponding subframe can be used for downlink transmission. If this IE is missing (omit), all the non-MBSFN subframe can be used for downlink transmission. This pattern can be repeated over 10 ms or 40 ms depending on the configuration of the following subfield. fdd-UplinkSubframeBitmapBR : This indicate which subframe can be used for uplink. '1' in the bitmap indicate the corresponding subframe can be used for uplink transmission. si-Narrowband : This indicate the narrowband index through which SI message for BL/CE UE. As in legacy LTE, the role of SIB 2 in LTE-M1 to broadcast the information as below. The location of SIB2 transmission in frequency domain is determined by the si-Narrowband-r13 in SIB1. If you want to figure out the exact PRB(Physical Resource Block) for the specified narrowband index, refer to Narrowband page. The transport block size that is used to transmit the SIB2 message is also determined by a SIB1 paramter, called si-TBS as shown below. Since PDSCH carrying SIB2 takes up the full LTE-M1 bandwidth (1.4 Mhz, 6 RB), you can figure out I_TBS(MCS) from following table. The StartSymbol (the first OFDM symbol for the PDSCH carrying SIB2) is also determined by SIB1 parameter called startSymbolBR-r13 as shown below.